18401 Phoenix Accessory Set. 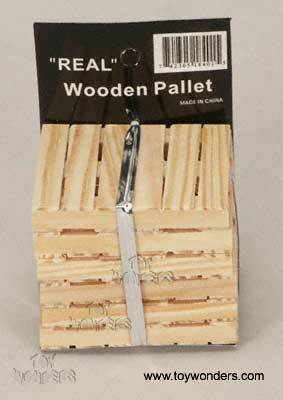 1:24 scale real wooden pallets. 6 pallets strapped together onto one card. Each pallet measures: 2"Lx 1.5"W x 0.25"H. Great for train layouts, dioramas, and other miniature sets. The picture shows 6 pallets bundled together; this is considered 1 set. This particular item is sold in lots of 26 sets. So when you order 20 sets, you will get a total of 20 x 6 pcs = 120 individual pallets. This accessory is often used in 1/24 scale dioramas. Sold in lots of 20 sets. Price quoted is for 1 set.